While sitting around the house yesterday doing some work and putting away Oreos and chips from a hilarious Instagram photoshoot (follow me to see all the pics from it), I had a major ah-ha moment about my personal diet recovery. I’ve finally gotten to the point where I’ve freed myself from feeling anxious or out of control around my binge foods. Inspired by this, I made a quick video explaining how to stop binge eating so that you all can start on this journey. Scroll to the bottom to watch the video. I’ve been at this point in my diet recovery for a while because I stopped restricting for good. One of the things I’ve learned through my own recovery and through coaching clients is that even accidental restriction will lead to overeating or binge eating. If I’m particularly busy one day running around or taking back-to-back clients and forget to eat enough, I will find myself overeating and frantically searching for food at night. This is the body’s NORMAL response to deprivation, even if it isn’t intentional. 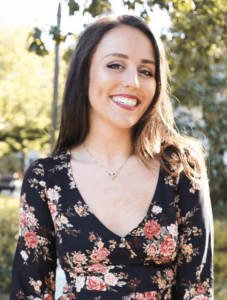 When the restriction is intentional though (aka when you’re dieting), being exposed to food that is considered “off-limits” can feel like a personal attack against you. When I was dieting, I was AGGRESSIVE with my mom about not keeping “bad” food around the house. I would get so upset if I came home to food I considered off-limits and furiously throw it in the trash to try to stop myself from binge eating. The problem is that removing food from your house is not going to stop binge eating. Unless you stop leaving your house completely (which, by the way, is definitely problematic and a major sign that it’s time to ask for help), you will eventually be around the foods you are afraid of, which will only cause you to obsess over these foods and binge. That’s because binge eating works like a pendulum or a bow and arrow. If you only pull the bow back a little (undereat for one day, maybe because you’re busy), then the arrow will only go a small distance (you’ll only overeat a little). 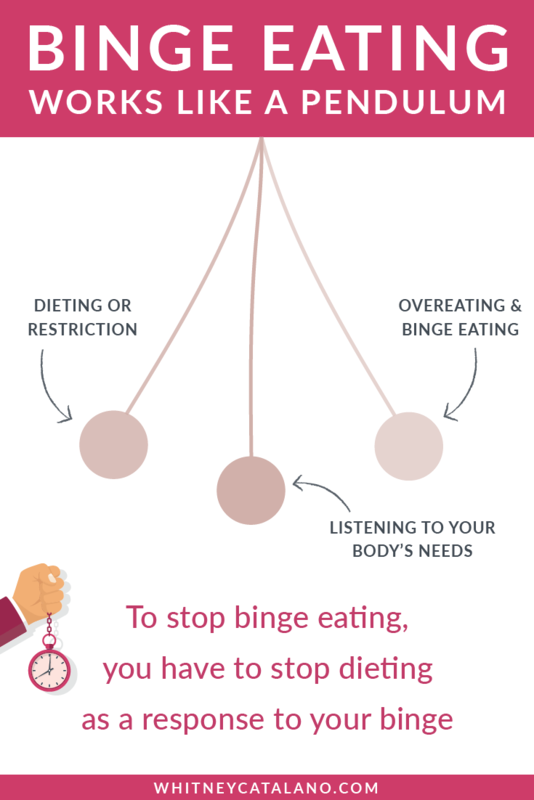 If you pull the bow back far by restricting regularly (dieting, “portion-control” or mentally restricting by not allowing yourself certain foods), your binge will be that much more intense as a response. Binge eating is your body’s attempt to keep you alive when it thinks you’re starving. When you think about it like that, it’s actually pretty beautiful that our bodies do that for us. And even if you’re not at the point of appreciating this, it can be helpful to know that you will eventually stop overeating. One of the hardest parts of diet recovery is waiting for that post-diet binge phase to naturally end. It’s easy to freak out about this natural need to binge during recovery because it feels like you’re going to binge for the rest of your life. The pendulum is a reminder that binge eating for the rest of your life is just as unsustainable as dieting for the rest of your life. You will eventually stop binge eating. But you have to give yourself permission to do so without jumping into a diet or restriction mindset in response. Watch through the video and let me know what you think in the comments. As always, don’t forget to follow me on Instagram, Youtube, Pinterest, and Facebook for everything anti-diet and self-love. 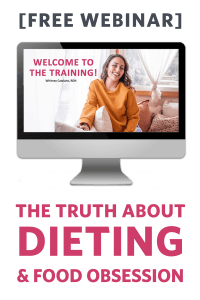 And subscribe to my newsletter below if you struggle with emotional or binge eating because I have an E-BOOK coming out where you will learn everything there is to know about both! 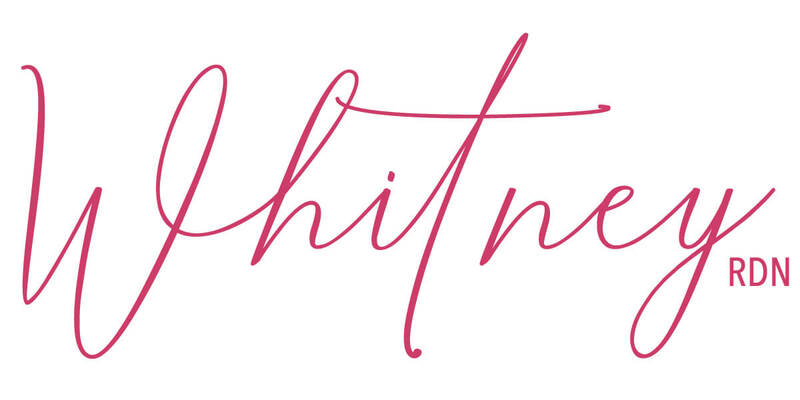 Hi I’m Whitney, a virtual intuitive eating Dietitian and body image coach. Your relationship with food and your body is a direct reflection of your relationship with life.